The PIA - Pride In Achievement Programme is made up of 5 levels of awards; Bronze, Silver, Gold, Emerald and Ruby. Children complete a number of Personal Challenges (at home) and a number of Pride In Achievement Certificates (at school) for each level. For Emerald and Ruby Awards a Service Project must be completed as well. Personal Challenges are activities that are to be completed at home. The categories are: Values, Academic Excellence and Physical Activity in the Outdoors. There are plenty of activities to choose from but you must complete one from each category. You can work on more than one at the same time. Check how many Personal Challenges you have to do for your award. Decide on which Personal Challenge you would like to do. Fill in the Personal Challenge Contract. You can download this below. Show your classroom teacher before you begin. Bring all your completed work for the challenge to your teacher for signing off. Make sure your booklet is signed off too. Share your activity at the next learning celebration. Pride In Achievement Certificates are activities to be completed at school. Choir, Art, Digikids, Jump Jam, Kapahaka, Librarians, Milk Monitors, Office Duty, Padder Tennis, Basketball, Single Wicket Cricket, Gardening, Peer Mediation, P.A.L.s, Student Leaders, Wet Weather duty. 1 x PIA given per term. Pride In Achievement Certificates are also given to students who represent Banks Avenue in cultural events or at a higher level in sporting events. For more details download the information booklet below. 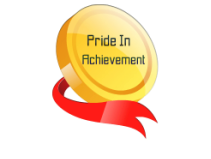 Check how many Pride In Achievement Certificates you have to complete for your award. Choose a club, sport or a way of giving service to the school and actively participate in this. You will receive a PIA certificate for each term of involvement. Show your PIA certificate to your teacher to sign off in your booklet. You can choose how you complete the other 6. They can either be PIA Certificates, Personal Challenges or both. Click on the button below for a list of Personal Challenges that can be completed. You can choose how you complete the other 7. They can either be PIA Certificates, Personal Challenges or both. You can choose how you complete the other 5. They can either be PIA Certificates, Personal Challenges or both.